I recently asked a senior figure in Stoke BNP if he thought his party was finished for good in our city. He looked me straight in the eye and replied: “I think we are Tone yes”. He went on to explain that his party had self destructed and imploded in the past two years and he laid the blame firmly and squarely at the doorstep of BNP Leader Nick Griffin. The story did not get better for the far right party as this activist said that the recent election campaign received no party funding what so ever. I was told that the BNP would never come back from this low point and that all the fight had gone out of the membership. The party insider revealed that they had really struggled to attract any candidate of quality. It had cost some candidates in the region of £750 to fund and fight the campaign. ”We just could not compete with the Labour Party and they just smashed us! “They were really organised this time especially in the centre of the city ““ colour leaflets and telephone campaigning, they knocked the doors en masse and they got their voters out on polling day. “I don’t know where the BNP go from here, there is no enthusiasm, and we haven’t met since election night. This dejected BNP member told of his anger at the way Griffin his running the party. It appears that if you question the BNP leadership you get an black mark against your name and before you know it you are out of the party. Griffin is holding on the all the available funds and party activists are left high and dry and are having to fund party expenses themselves. Many BNP members believe that Griffin his hanging onto the purse strings to fund his, and Andrew Brons’s next European Election campaign. The Stoke BNP member believes that if Griffin is successful in getting re-elected to the European Parliament then, and only then will he relinquish the chairmanship of the party. ”It’s all down to money with Griffin Tone, He has his entourage to pay for and we believe he employs his wife and his daughter out of his European expenses. “He is doing all right and we are struggling to fight a campaign against the might of the Labour Party machine. “I just want to serve as I always have, but everything you do is futile without any party funding to help get leaflets delivered. “I just wonder where all the money has gone, but it’s no good questioning anything either, only the chosen few know the true picture. “In four years time we will have a general election to fight alongside the local elections. With people getting fed up and moving on you wonder if we will be able to fight either election. “The morale is at rock bottom in the party. People are asking if there is any point meeting and if there is anything that we as a group can do anyway. “This city has four years of Labour to contend with and I’m not sure if the BNP has enough to scrutinise from outside the chamber”. BNP Leader Nick Griffin claimed nearly £300,000 for his first year as a MEP. This has led to accusations about him jumping aboard the gravy train that he and his party were so outspoken about. He is yet to answer just how much of his income he has donated to the British National Party. It has been a spectacular fall from grace both in this city and nationally for the BNP. At the height of their popularity in 2008 they had 55 councillors nationwide and 9 in here in Stoke-on-Trent. Now in 2011 they have just 12 councillors across the country and here in this city they have been wiped out of the chamber. The far right party defended 12 council seats across the country but held on to just 2. With things as bad as the senior Stoke BNP member paints it, you really do wonder if this is the end for the BNP. Nationalist parties seem to have been rejected unilaterally by the electorate locally and across the country. In 2010 the England First Party fielded candidates against the BNP in Stoke. In 2011 they had an agreement not to stand against each other. Out of 16 far right candidates fighting the City Council elections, none were successful. Of 74,321 votes cast in the Stoke-on-Trent local elections, just 3,690 went to “Ëœnationalist’ candidates. Politics is often like music and fashion trends, something is fashionable and popular only to fade away and then without warning it is back again. The same could be said about the politics of the far right. Opponents of the far right, organisations like Searchlight, Unite Against Fascism, Hope Not Hate and NorSCARF will not drop their guard. They know better than most that just because the BNP, England First Party, EDL and the English Democrats have been forced into being dormant, it does not mean that they have gone away altogether. The problem for far right parties and in particular the BNP, is when their own supporters believe that they are finished it is very difficult for their party leaders to convince them otherwise. The BNP Roadshow hit Stoke-on-Trent today [Sunday] to launch their local election manifesto. Three British Party [BNP] leadership contenders have failed to win enough support from party members to force a ballot to overthrow Nick Griffin. Derek Adams received four votes, London Assembly member Richard Barnbrook received 23 and ex-national elections officer Eddy Butler got 214. A candidate required 814 votes to force a leadership challenge. Mr Griffin received 995 nominations and will remain in power. He has led the BNP since 1999. Earlier this year Griffin announced that he will stand down as leader by 2013. A dismal campaign in both the local and general elections left party members questioning their future direction. Just two days before the election, a major fall out rocked the BNP. As a result of a dispute between Nick Griffin and former BNP webmaster Simon Bennett, the latter shut down the Party’s Website, Facebook and Twitter pages. The result was that the party was left with just a single temporary holding page on their home page on Election Day May 6th. Griffin failed to make any impression what so ever through the ballot box in Barking. He finished a distant 3rd behind Labour’s Margaret Hodge, who doubled her vote and Conservative Simon Marcus. The BNP did increase it’s share of the national vote by 1.83% but failed to deliver the Member of Parliament it claimed was within their grasp. The BNP also lost a number of Councillors across the country. The finger of blame has also been pointed at Griffin for the near financial ruin of the far right party. The ongoing legal action by Unilever over the use of a jar of Marmite in an election broadcast is set to cast the BNP a substantial amount of money. The party’s legal advisor Lee Barnes has also quit the party amidst a series of allegations he has made about the BNP. Mr Barnes claims that the BNP are ‘technically insolvent’ and that donations, membership renewals and enquiries have ‘slowed to a trickle’. In Stoke-on-Trent the BNP under local leader Mike Coleman are desperate to rebuild post election in readiness for next years all out elections. He will no doubt hope that this difficult turbulent phase of his party’s history is at an end. Under Griffin’s stewardship and a fractious fragmented membership all bets will be off. The Deputy Leader of the British National Party has resigned with immediate effect. Simon Darby fought the Stoke-on-Trent Central seat for the far right party at the recent General Election. He finished a disappointing 4th with just 2502 votes, way behind Labour, Lib Dems and the Conservatives. 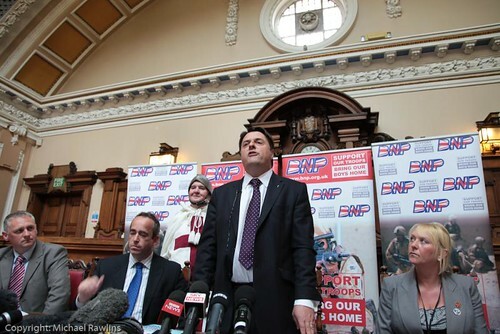 The catastrophic performances in the both the Local and General Elections forced BNP Leader Nick Griffin to announce that he is to step down from his role by 2013. Simon Darby’s decision is seen as a show of loyalty to Griffin and a warning to his potential successors. “Quite simply, the post of Deputy Leader has absolutely no constitutional standing, with it being a discretionary appointment being made or not by the duly elected Leader. For anyone to seek to make it an issue in a BNP Leadership election is therefore misguided at best, or insincere at worst. As a result, and wishing to avoid a descent into personality-orientated factionalism, I am going to set an example. I have therefore decided to resign as Deputy Leader of this Party with immediate effect. My purpose in this decision is not only to take this distraction out of the election. Also, if I can endure self-imposed demotion for the greater good of this Party, then I have the moral right to ask that others at least exercise responsibility and restraint. “This Party would be nothing if it wasn’t for Nick Griffin’s total and unreserved commitment to the nationalist cause. It would be a sad, contained creature for contempt and ridicule, rather than the snarling, fighting, in-their-face beast that it is today ““ a constant rebuke and reminder to the Establishment of their treason, betrayal of our people, and the price they will one day have to pay for their crimes. Simon Darby’s decision has not only come as a shock to Stoke BNP Leader Cllr Michael Coleman, but as a huge disappointment too. Cllr Coleman, who is tipped as a possible main player in the BNP at some time in the future, has appealed for the party to move more to the middle ground of politics. He is calling for the BNP to adopt a strategy which would call for ethnic groups to be left to follow their own culture and religions whilst allowing the indigenous population the freedom to pursue their tradition and lifestyle. You can hear more from Michael Coleman in the Audio Interview below. Potential candidates are jockeying for position to take over the national leadership of the British National Party. The man described as the BNP “ËœElection Guru’ Eddy Butler is mounting a leadership challenge to Nick Griffin this summer. Butler claims that Griffin cannot combine his duties as an MEP with the effective running of the BNP. He claims the evidence lies in the disastrous election results in May. His campaign has been boosted with the news that Nick Cass the Yorkshire BNP Organiser has announced that he supports Butler’s campaign and will be his running mate in the election. Cass has stated that he intends to stand for Deputy Leader, a move that prompted Simon Darby to resign with immediate effect. Whether Butler and Cass will become the BNP’s new Batman & Robin remains to be seen but reports suggest that the membership want a clear new dynamic direction and as yet they are the only credible alternative. Their path to the leadership is one full of obstructions however. They are required to obtain the support of 20% of the BNP membership of two years standing. They are known to have the support of some regions including Yorkshire & Liverpool. Nick Griffin To Step Down As British National Party [BNP] Leader. BNP Leader Nick Griffin has announced that he is to step down by 2013. His decision comes following a weekend long meeting of the party’s Advisory Council. The meeting focused on the BNP’s performance in the recent General and Local elections. The current membership and the modernisation of the party were also on the agenda. Griffin had come under fire from certain sections of the BNP membership following their failure to get an candidate elected to parliament. The BNP also lost councillors across the whole of the country but in particular at Barking & Dagenham where the lost all 12 of their sitting councillors. Here in Stoke-on-Trent the party suffered 3 losses in the Council Chamber. Griffin claims that his decision will allow him to concentrate on getting re-elected to the European Parliament. Many commentators however will speculate on whether this is a compromise deal to ease Griffin out of the Leadership instead of facing yet another attempted hostile takeover. What Now For The BNP Nationally And In Stoke-on-Trent? As the dust settles on both the General and Local Elections, the various parties will start analysing their performances and making the changes they need as a result. Questions are being asked of the party leaders, particularly those who failed to deliver. Gordon Brown is facing calls from a few of his MPs to step down and the same can be said of the British National Party Leader Nick Griffin. There are many calls for Griffin to stand down and it is thought that Eddie Butler who is head of the Party’s Election Department could challenge him for the party leadership. Contributors to a number of far right Internet forums are also questioning Griffin’s leadership. There have also being a number of high profile fall outs within the party in recent times. First came the spat between Alby Walker and the BNP. Walker accused Griffin of using the party to make himself rich and famous. He also claimed that there was a vein of holocaust deniers and members who display Nazi-esque sympathies within the party. Then came the very public falling out between Griffin and Mark Collett, who at the time was the party’s publicity Director. There was no shortage of publicity when it was revealed that Collett was plotting to overthrow Griffin as leader. The result was that Collett allegedly threatened to kill Nick Griffin. The Police were called in to investigate the matter. Finally, just two days before the election, another fall out rocked the BNP. At the BNP’s recent election manifest launch, Nick Griffin was at pains to point out that his party no longer needed the mainstream media as their website had more hits than that of the Labour Party’s, the Conservatives and the Lib Dems put together. Those words must be coming home to roost right now. The BNP did increase it’s share of the national vote by 1.83% but failed to deliver the Member of Parliament it claimed was within their grasp. In Stoke-on-Trent, BNP Deputy Chairman Simon Darby staged a massive campaign. He worked the constituency tirelessly. But his work failed to materialise into votes and he crashed to a humiliating defeat in Stoke Central. Darby finished 4th behind Tristram Hunt [Labour], John Redfern [Lib Dem] and Conservative Norsheen Bhatti who is of Asian heritage. The electorate often described as the BNP ‘jewel in the crown’ chose an ‘Asian belly dancer’ as the BNP often refer to her, over the Deputy Chairman of a nationalist party. Surely there can be no greater insult to their policies? Mike Coleman failed to oust Rob Flello in Stoke South whilst Melanie Baddeley failed to make any impact in Stoke North and managed to go through the entire campaign without giving a media interview on her chances and her party’s core aims and values. The only time she did engage with the media was in reaction to the news that her husband had been arrested and subsequently charged with possessing cannabis. He is currently on Police bail. Mike Coleman is keen to get the message out that his party is not defeated and will pick themselves up and work towards the all out elections for Stoke-on-Trent City Council in 2011. But, the BNP will have their work cut out if they are to halt and reverse their apparent decline. At the local elections they lost 26 councillors across the country including all 12 from Barking and Dagenham. They now have just 19 councillors in total across the country and are 15 behind the Green Party who have 34. To put their task of challenging the 3 main parties into context you need to realise that the Conservatives have 3369 councillors, Labour have 2865 and the Lib Dems have 1665 across the country. We managed to catch up with Stoke BNP Group Leader Mike Coleman earlier today who remains upbeat about his party’s performance and future prospects. I like their ideas on crime, if perhaps a little draconian, at least they are taking a tough stance. However, I have been critical in the past of the BNP because of their approach to race issues. We all know that Race is the sticking point that the BNP cant seem to get over, it’s what stops them from gaining any real power across the country. Being born of the NF the BNP started out racist, had racist views from the outset yet,recently, they claim to have changed. Now, I’m not saying all BNP supporters are racists, but to be sure, some are. Probably a lot are because the BNP are the party that wants to restore Britain to what it used to be before non white immigration happened on large scale. Since I have started writing articles for pits and pots , as opposed to just making the odd comment, I have decided to try to be as impartial as possible. Rather than shouting at, and about people because I don’t agree with their views I’m trying to listen, and question them. Thursday was a very interesting day. I went to the Civic with some trepidation, not knowing what to expect. I have to give the BNP their dues in certain respects. Everyone was polite and courteous and I chatted to a few of the BNP workers who were there before I got to the politicians. I asked one of the BNP security team what leads someone to join the BNP? He told me that he came from St Helens, and that the town had been decimated by unemployment after all the mining and industry had been wiped out. I asked if the town had a problem with migrant workers and he told me it was something like 97% white. He was a man of few words really, but I didn’t get the impression he was massively motivated by race issues. The camera man was decent too, whilst setting the camera up in the chamber, I spotted a camera that was set up properly and had used gaffer tape to make the mic lead safe and not a major trip hazard like so many of the others. I asked a small bald headed chap if he had any gaffer tape I could borrow, he said yea sure and disappeared off to fetch it for me. Only later on did I find out that he was the BNP camera man. The conversation was alright, although I did a fair bit more talking than him, that’s just me though and I was a bit nervous about being in a 12ft square room with Nick Griffin and 2 large members of his security team. I seriously oppose racism of any kind and to shake hands with someone who may want to potentially expel me and my descendants from the country is a strange emotional sensation. Manners is the order of the day though and I wasn’t about to be rude to anyone who had shown me hospitality. Whether or not the BNP have really moved beyond their racist roots or not is irrelevant, if I’m to do the job of reporting political stories with any integrity, then professionalism must guide me, not emotion. After the Griffin Interview I had the opportunity to interview Deputy Leader Simon Darby and local councillor and PPC Mike Coleman. The media actually barged past us and forced us to be last, however, that wasn’t Mr Darby’s fault, more our own naivity and inexperience. When we sat down Mr Darby was relaxed and gave well considered answers. If anything was lacking it was my own questions, I could have queried him a little more forcefully on a couple of points. My style isn’t adversarial though, in real life situations I am certainly more gregarious but when Interviewing I at least try to let the interviewee feel comfortable because I want them to talk, not lock up. I also want my interviewees to walk away thinking that I was fair, and that any information offered by accident was more their their error than my aggressive attempt to trip them up. Like this http://news.bbc.co.uk/1/hi/programmes/the_daily_politics/8639811.stm . Whilst I thought her questions were actually very good, her manner was abrasive and put Simon Darby in the Defensive, thus we didn’t get the answers. Perhaps Jo coburn thught she was upholding the rights of the people by dismissing Mr Darby in a terse manner, but I think her interview style simply made him appear to be the victim of a biased media. That’s what sticks in peoples minds, not the fact that he dodged the questions. Simon Darby has a serious demeanor and steely grey eyes which could un-nerve anyone but he’s a no nonsense guy, and someone I feel is willing to answer questions freely if approached in the correct manner. The BNP seemed a lot better in the flesh than what one is able to glean from the internet and newspapers reveal about them, lending some weight to the BNP’s argument that the media is biased against them. Having been at the launch from start to finish, I know what went on, I know what was said and what wasn’t, but on the evening of the event the mainstream medias coverage was poor and paltry. Considering they waited all day for their interviews, they certainly took it out on the party by way of their reports. They chose to focus on the man dressed as St George, more than the content of the manifesto or the words of the politicians. It was 13 Years ago Nick Griffin told Roger Cook that ultimately he would force non whites to leave whether they wanted to or not.http://www.youtube.com/watch?v=6X8QQwU00Jk this Thursday we saw Nick Griffin promise to protect the rights of “settled minorities” who had paid into the system and earned their right to be British. http://www.youtube.com/watch?v=Q0IL2dQsQsE . Within the last Decade the BNP has had links with more extreme organisations, and more worryingly what Mr Griffin told a group of White nationalists about the sort of language that needed to be used to win over the British public. http://www.youtube.com/watch?v=04QolIvfQEw these are the things that I believe the BNP need more questioning on. It’s no good shouting ” Nazi Scum” and throwing eggs at people, that isn’t democracy. Listening to the words, and scrutinising is really how to make informed choices. Without hearing the whole story, who can see the wood for the trees? The Chairman of the British National Party Nick Griffin chose to launch his party’s manifesto in the city he describes as the BNP ‘Jewel In The Crown’ – Stoke-on-Trent. He described the manifesto as the most comprehensive his party have ever produced and that it proves that there is more to the BNP than immigration. Simon Darby the party’s PPC for Stoke-on-Trent Central was also in attendance as was Michael Coleman PPC for Stoke-on-Trent South and Melanie Baddelely the PPC for Stoke-on-Trent North. 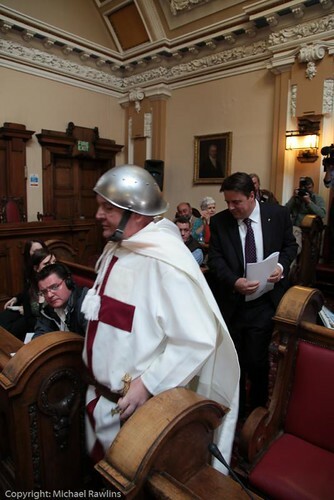 The manifesto was launched in the grand setting of the Council Chamber and also featured a party supporter dressed as St George who escorted Mr Griffin into the chamber accompanied by applause from a number of party supporters, members and BNP councillors. After Mr Griffins overview of the Manifesto journalists were invited to take interviews. We bring you Interviews with The Leader Nick Griffin, Deputy Leader and PPC for Stoke central,Simon Darby and PPC for Stoke South Michael Coleman. To access the entire range of Pits n Pots video interviews, visit our YouTube Channel by clicking the ‘our youtube’ tab at the top of the page. 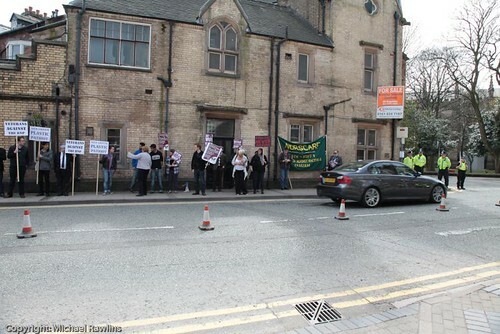 As with all BNP events there were protesters outside the venue. Protesters from " Nothing British about the BNP" and a small group from Staffordshire University lead by former S.U Leader Assed Baig kept a constant vigil outside the Civic Centre. Pits and Pots waited the whole day to bring you the whole interviews, Melanie Baddeley unfortunately had to leave early. We did manage to get interviews with Nick Griffin, Simon Darby and Mike Coleman, which can be viewed below. Is The Willfield Centre Really Safe? ‘After 4 months of lobbying, badgering and protesting, the British National Party Group on Stoke on Trent City Council have been successful in getting the popular Willfield Fitness Centre in Bentilee removed from the council’s cut back list as indicated in the 2010-2011 budget’. But the question is, is the Willfield Centre really saved and did the BNP play a serious role in getting the proposed closure of the Willfield Centre removed from this years budget cuts? “It is not strictly true to make out that the BNP group got Willfield taken out of the budget by themselves”. “All group leaders have played an active part in the discussions relating to the Annual Budget. 30 or so of the councillors attended a briefing and had their say and it is fair to point out that there were a lot of concerns over the proposed closure of the Willfield Centre”. “I am aware that BNP Chairman Nick Griffin sent an email to all the West Midlands MEPs asking for help to save the centre as it is in Bentilee which is a BNP stronghold, so I can understand his concerns”. “The fact remains though, that the Willfield Centre may be pulled back into the melting plot”. “Some parts of the centre are very underused so there will have to be discussions over the long trem viability of the Willfield Centre. It’s future will be part of the root and branch review, due to take place in March, which will decide the future of the Willfield Centre and other facilities”. “To say that the Willfield Centre is saved is a tad premature”. Listen to the Audio Interviews below. The first is with Cllr Roger Ibbs who says that many Councillors had an input over the future of Willfield and any suggestion that the BNP were solely responsible for it’s reprieve is disingenuous. The second Audio Interview is with Cllr Mike Coleman, Leader of Stoke BNP, who says that any future attempt to close Willfield will be met by fierce opposition.